The Christmas season is upon us now and I've already recovered from Thanksgiving. So now that I have space in my stomach to think about cooking, I've decided I'd share some videos that I thought would be yummy christmas cookie ideas. Hope you enjoy them and try to bake some of them this holiday season. I will most likely bake Nigella's Christmas Chocolate Cookies since my husband is a huge fan of the cocoa. Have a Thought-Provoking Tuesday! I tried to link to the BBC YouTube channel but YouTube says it's not available in my country. Either way, for more of Nigella visit her official site Nigella.com. This next video was easy and fun to watch. It's produced well and they have a good sense of pacing when it comes to tutorials. Plus I appreciate their lighting! But even more than all those technical marks, this cookie is easy make, texture-rrific and customizable if the main ingredients aren't your favorite. I would add crushed pretzel and some Chex. Visit Kathy's channel StartCooking for more recipes and awesome instructions! This video was found whilst I was searching for Old World-kinda cookies. The measurements are not American standard but I'm sure you can figure it out faster than I could with a converter. Don't these babies look so tempting? I'm a sucker for fruit-filled confections during this season. This video was posted by DeliriumReal. For more Christmas Cookie related videos by them, visit this video on YouTube and there should be a couple more tutorials on the sidebar. The video below isn't an obvious christmas cookie but every now and then I like to break free my palette from the usual spiced or sugary treat and add a touch of citrus to the mix. With some red and green sprinkles, these lemon drop cookies will certainly be welcomed to any holiday party. When using Crisco for baking, I prefer to use their butter flavored shortening for cookies and pie crust. Thank you Lacy for that tip! Visit Crisco's YouTube channel for more recipes. Baby showers are so fun to bake for. If it's a girl, you can go crazy with pink, damask, princess and all things girly-girl. If it's a boy, there are planes, trains, robots and all things boy. If you don't know or you want it unisex...then this cupcake decor of animals and pearly sprinkles is the perfect fit! Yummy homemade white moist cake and homemade buttercream frosting. Made with love. Happy Monday! Hang in there just two more days till Thanksgiving break. 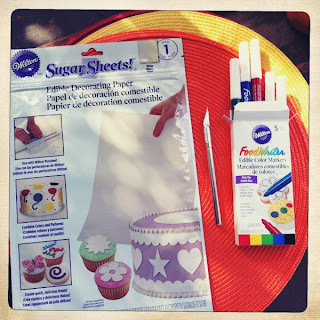 Surprise your cupcakes eaters and get super creative with Sugar Sheets! Yep, that's what I just recently discovered this past week. I can't believe how much stuff is out there for cake decorating. I remember just being happy with piped roses and plastic balloons on birthday cakes. Today you can find just about anything. These cupcakes that I made were for a baby shower this weekend. I knew it was a boy and I also knew his father loved robots and robot toys. Originally, I was ambitious enough to think I could create a Voltron theme....no...not this time. Voltron was more complex than I thought. I'll save that one for later. So instead I drew inspiration from pics on Google images for "cute robots". Like this one. And this one....and this one. For more information on Sugar Sheets. For more information on Punch.Cut.Decorate! Cut out or Punch out a circular shape. Use edible markers to create Robots and/or writings. Gently place decorated sugar sheet shape onto pre-frosted cupcake. I rolled today. I craved cinnamon rolls and I enjoyed every moment of my Immaculate Baking Co. Cinnamon Rolls. I found this brand at Whole Foods market a couple days ago. It is all natural and very delicious indeed. If I wasn't so full I think would be able to finish all five rolls that come with each tube. I'm a consuming machine deep, deep, down inside. For more information on this company visit their site here or www.immaculatebaking.com. Have you ever had steamed buns filled with delicious veggies and meats? Perhaps you've had them homemade or at a dim sum eatery. But have you ever had them looking this cute and yet so morbid at the same time? I'm not on a Halloween-morbid kick. But I've had this photo in my files for a long time and I thought it would be a great day to share it. Do you have any funny food pics like this? By the way, I found this food at a Thai convenience store two years ago. I couldn't resist. I think if I ever find it again, I will definitely have to try a nice hot steaming piggie bun. Sorry Babe. Happy Friday! I'm still riding the candy wave from trick or treating. In fact we just got rid of most our candy last night. (Thank you Dear Husband). Well, I don't have the specific recipe for this cheesecake but I can tell you that it was delicious and completely homemade by my sister. The consistency reminded me of Jell-O pies that involve a packet of the particular pie flavor and whipped cream. I love Jell-O desserts, don't get me wrong, but this was truly something special. Much love was put into this cheesecake. Much love. She used organic cream cheese, fresh whipping cream, organic strawberries, a cup of strawberry yogurt, less than a 1/2 cup of sugar and for the crust she used homemade pound cake. Chill overnight or a couple hours and Voila....AMAZING! Let me share with you some pics of her adorning this beauty.